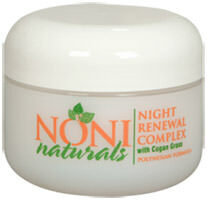 Q: What products are part of the Noni Naturals Skincare? Exfoliating cleanser that provides deep cleansing without abrasive scrubbing. Use: Apply small amount to fingertips and gently cleanse in a circular motion on moistened face and neck. Add water as needed and continue cleansing. Rinse thoroughly with warm water. For best results, use morning and evening. Restores proper pH to freshly cleansed skin. Provides antioxidants and further soothes. Use: Place a small amount of toner on a cotton ball and apply to entire face and neck. Provides anti-oxidant protection while restoring the skin to a youthful glow. Use: Apply 2-3 drops of this fruit acid formula on face and neck. Light moisturizing cream restores skin to its youthful tone. It provides regenerative features while helping to repair damaged skin. Use: Beginning at forehead, apply a small amount in a circular motion working around entire face and neck area twice daily. High potency formula in a liposome (a tiny bubble that contains the helpful ingredients) delivery system that provides needed moisture to delicate eye health. Use: Lightly tap a small amount from the outer eye to the inner corner. Helps skin elasticity. Moisturizes and hydrates as you sleep. Use: In the evenings, after cleansing and toning, apply to face and neck. Helps to repair skin while it hydrates. Use: Apply liberally to skin twice daily.